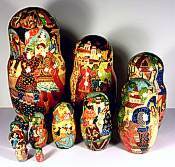 The nesting doll, or "Matryoshka" in Russian, is a hand-painted set of wooden dolls which are nestled into one another. 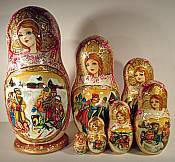 It was originally a peasant toy appearing in Russia in the 1890's. 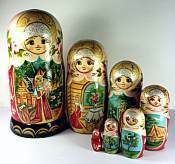 The name matryoshka has the latin root "mater" (mother) and these dolls are considered as symbols of motherhood. 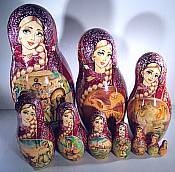 In 1900, the Russian matryoshka was presented at the Paris World Exhibition and has been popular ever since. 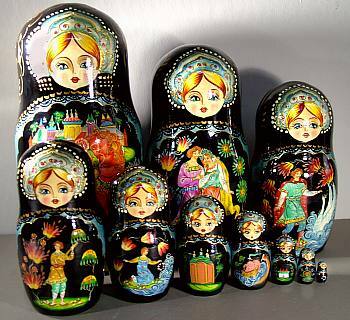 Craftsmen make these dolls from birch trees and perform 15 operations until the doll is ready. 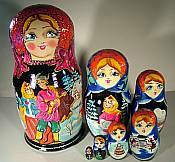 The dolls are made in many areas of Russia and the former USSR, with the village of Sergiev Posad being one of the more famous producing areas. 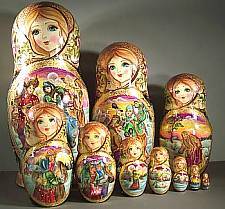 Traditional matryoshka dolls, like the ones here, are individually hand-drawn and are unique objects of creativity and inspiration. 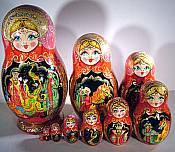 Search results: Page 1 of 1 total page with 28 results. 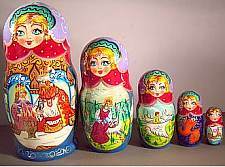 0.69" x 0.69" x 1.28"
4.00" x 4.00" x 9.00"
Scarlet Khokhloma - 5 pc. 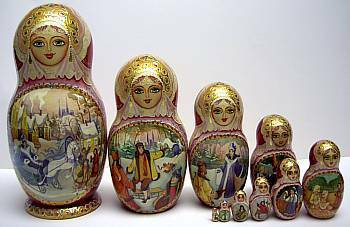 1.88" x 1.88" x 3.50"
2.75" x 2.75" x 6.00"
5.00" x 5.00" x 11.00"
0.79" x 0.79" x 1.28"